Sukin is a brand I've featured a number of times over the years, not only are they affordable but I've enjoyed how the products perform. The Super Greens Nutrient Rich Facial Moisturiser is one I've repeatedly purchased for my husband. The Derma range sparked my interest and I found the range available through online retailers. Derma Sukin targets problematic and condition-prone skin and the range includes Face & Body Wash (Hydrating, Gentle or Oil Balancing), Intensive Hydrating Cream and Gentle Face & Body Lotion. 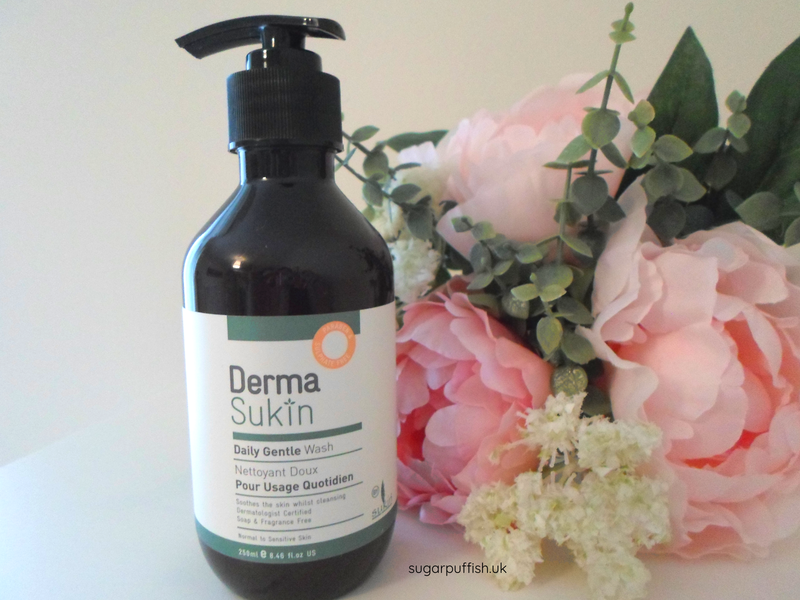 Derma Sukin Daily Gentle Wash is a runny consistency which hasn't been to my liking for a body wash however I've opted to use as a facial wash. It's ideal for those occasional days when I'm feeling super lazy and cleanse in the shower. Alternatively it can be used on dry skin and removed with a damp cloth. I've tried both methods and both options work for me. I normally shy way from facial wash but I haven't found this cleanser to be overly drying and it appears to maintain a good balance. The pump bottle packaging is useful but I suggest cupping your hand near the spout because on a couple occasions I manage to squirt product across the bathroom. The only minor downside for me is I find the scent to be "medicinal" and I was hoping for a fresh aroma of cucumber. I've a handful of favourite cleansers which to be honest Derma Sukin Daily Gentle Wash wouldn't replace however that doesn't stop me recommending. I think the range is filling a gap for those with fragrance sensitivity/allergy or skin conditions like eczema. I would suggest it's worthy of consideration if you are struggling to find suitable skincare.